Notes: This is New Orleans' oldest surviving cemetery. The first above-ground burials were made here in 1789, a year after a flood, an epidemic, and a fire destroyed a large part of the city. 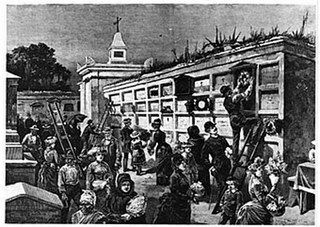 Surrounded by wall vaults, filled with crumbling tombs, this is New Orleans' City of the Dead. The jumbled maze-like paths will remind you that death does not always wait for a planned and orderly cemetery. Creoles, Americans, slaves, immigrants, Catholic, Protestant, all are buried within these walls. Spanish influence in the architecture predominates in the wall (oven) vaults, wrought and cast iron, and plaster-over-brick. Tombs of interest include the family tomb of the Creole character Bernard de Marigny who, when bankrupt, sold his plantation and the Marigny district was created. He also named some of the city's streets- Desire, Elysian Fields, Craps, Pleasure, Duels, Piety and more. Here is the Glapion tomb (descendants of Marie Laveau and the reputed resting place of the Queen herself) and the Italian Mutual Benovolent Society tomb as seen in "Easy Rider".